The Green Scapular or Scapular of the Immaculate Heart of Mary is, like the Miraculous Medal, a gift of our Blessed Mother to the Daughters of Charity of St. Vincent de Paul. On November 27, 1839, Justine Bisqueyburu, destined by Providence to make known this devotion, entered the Novitiate of the Daughters of Charity, 140 Rue du Bac, Paris. On January 28, 1840, during her first retreat, the young sister was favored with a celestial vision. Our Lady appeared to her clothed in a long white robe over which hung a bright blue mantle. In her hands she held her Heart, from the top of which issued brilliant rays. The same apparition was repeated four or five times during her novitiate. These favors seemed to have no other end than to increase tender devotion to Mary Immaculate. Clothed with the habit, on September 8, 1840, feast of the Nativity of the Blessed Virgin, Sister Bisqueyburu was favored during prayer with an apparition of the Mother of God, who held in her right hand her Heart surrounded by flames, and in her left a sort of scapular, consisting of a single piece of green cloth suspended from a cord of the same color. On one side was a picture of the Blessed Virgin as she had shown herself in the apparitions; on the other, a Heart all inflamed with rays more brilliant than the sun, and clearer than crystal. This heart pierced with a sword was surrounded by an oval inscription, surmounted by a cross. The inscription read: "Immaculate Heart of Mary, pray for us now and at the hour of our death." At the same time an interior voice revealed to the Sister the meaning of this vision. She understood that this new Scapular, through the medium of the Sisters of Charity, would contribute to the conversion of those who have no faith, and above all, procure for them a happy death, and that it should be distributed with confidence. As the scapular was distributed, wonderful conversions and some bodily cures were produced. The Scapular is not the badge of a confraternity but simply a double image attached to a single piece of cloth and suspended from a cord. The Blessed Virgin declared to her faithful servant that no special formula of blessing was necessary. It suffices that it be blessed by a priest and worn by the one for whom it is intended. It may be placed in the clothing, on the bed, or simply in the room. The only prayer to be recited is the inscription surrounding the heart on the reverse of the Scapular: "Immaculate Heart of Mary, pray for us now and at the hour of our death." This should be repeated daily, if not by the one wearing it, by the one giving it. The Scapular may be distributed everywhere. Although wonderful graces are attached to it, they are proportionate to the confidence with which it is given. 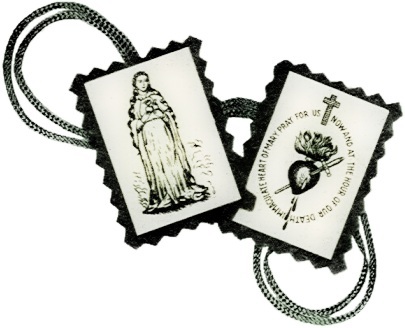 The Green Scapular was twice approved by Pope Pius IX, in 1863, and again in 1870 when he said: "Write to these good Sisters that I authorize them to make and distribute it." The Green Scapular and Its Favors (Booklet) - by Rev. Father Marie Edouard Mott, C.M.